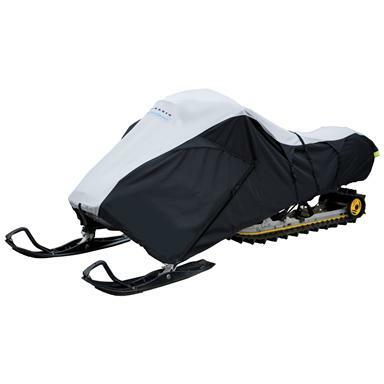 Classic AccessoriesTM Deluxe Snowmobile Cover... perfect protection for the value of your "winter zoom"! All my snowmobiling friends here in Minnesota have big smiles on their faces lately! Reason being that this looks like the kind of winter with enough snow for plenty of thrill rides! Sure hope that's true where you live, friend and that you'll have lots of great, safe rides this year and for many years to come! Between those rides, you'll want to keep your sled well protected, and this Deluxe Snowmobile cover is just the ticket! It's a heavy-duty Cover with an integrated trailering strap system and a fuel tank easy access flap. Size Medium Fits: One-Person Snowmobiles 100"l.
Size Large Fits: Two-Person Snowmobiles 101"-118"l.
Size X Large Fits: Touring & Work snowmobiles 119"-127"l.
Classic Accessories Deluxe Snowmobile Travel Cover is rated 3.0 out of 5 by 8. Rated 1 out of 5 by markymark from poorly designed the material seems tough enough but the overall design is poor. There is not sufficient material on the sides to cover the seat and tunnel. Everything is exposed so when travelling the seat and tunnel is soaked in slush, salt and sand. The fastening system is cumbersome and time consuming. Hooks and straps everywhere that make it difficult to throw the cover on the snowmobile, Fastening is a nightmare. Overall I would not recommend it at all because it's too skimpy, too cumbersome and to time consuming. When its -30 outside I don't want to spend a lot of time trying to cover or uncover my snowmobile. Recommend you stay away from this item. Buy a 25 dollar tarp with grommets and a handful of bungee cords. You'll save money and time and your sleds will be completely dry. Rated 5 out of 5 by Jimmy from Awsome cover for the price This X-Large cover fits my 2013 Renegade 137" great with some extra room. It stays on very well while travailing even though the straps come a little loose. I had this cover for my older sleds for years that sat outside and it did well I think after the 5th or 5th year it ripped where the handle bars are from me trying to make it to tight. This happened partially because it was faded and starting to dry rot a little but it is one of the best covers I have owned. Rated 4 out of 5 by Pattie from 2017 Arctic Cat ZR I just purchased this to store my 2017 ZR4000 for the summer. I can say it fits well for not being a custom cover has a lot of straps and adjustments to keep it in place. I can't speak for the durability yet as I have only owned it a week. Rated 5 out of 5 by JB sr from Great at this price I've tried this cover on the machine , on the trailer ,on the road and it works just fine. the road was wet,and my machine stayed nice and dry,and not covered with salt or dirt,( just the cover) and then I just hosed off the cover,to get it clean again The straps worked great at holding the cover down,,,good cover,great price! Rated 3 out of 5 by The Waz from Too Many Straps! I received the cover and the 1st thing I noticed was the number of tie-down straps. I put it on my Polaris Indy Lite and the fit was ok. But the straps! I didn't need all of them and may cut them off at some point after actually pulling the sled down the road. It looks like it should do what I desire, though. For the price, a good value. Rated 2 out of 5 by trapper from Good material needs more variety I was interested in your covers but none of them seem to fit the touring two up REV platform. Let me know if your company plans on making covers to fit the REV style as this is the most common sled today. The Z style platform which your covers seem to fit is on the way out. Cover up your Eskimo® for safe travel.